Landscaping is the home décor part that often pulls at your patience. Everything takes time to grow and become the elaborate picture you have in mind. When you begin working on your lawn, your trees are small and growing. With time, as the trees increases in length, you notice the grass under the trees deteriorating. You wonder how you can grow grass in the shade. Well, stress no more, here is how you go about it. Grass needs four hours of sunlight to thrive. When trees are younger, they have no shade allowing the grass its fill on sunshine. However, when the trees develop a shade, the grass under the trees is deprived of the sun. The key to keeping your trees neat and healthy is pruning. Subsequently, pruning will help the grass growing under the tree. Once you take away the thick branches, sun rays can make their way to the grass providing ample sunlight for growth. When pruning lawn trees, thin the canopy and “limb up” the tree by removing the lower branches. Don’t prune your trees if you don’t know how to, speak with an arborist instead. When it comes to grass, it’s not a one size fits all. Not all grass seeds will grow on your lawn. It is essential to get the right seeds that will thrive in your area. Remember, you need to consider how cold or warm your region is before picking grass seeds. Also, there are grass seeds like St. Augustine grass that will grow in the shade. These seeds adapt to areas with a shade better than open spaces. Grass needs water to survive, therefore, watering your grass is a sure way of getting good grass on your lawn. However, it is also imperative that you know when to water the grass. from the soil. With such trees, you need to water more often. For photosynthesis to take place, grass needs sunlight. Without sunlight under the tree, photosynthesis takes longer which stunts the growth of the grass. To combat this, leave the grass under the tree at least half an inch longer than the grass in open places. Reason being, the more space on the leaves you allow, the bigger the area on the blade that photosynthesis can occur. Nutrients are essential for the growth of grass as well as the health. 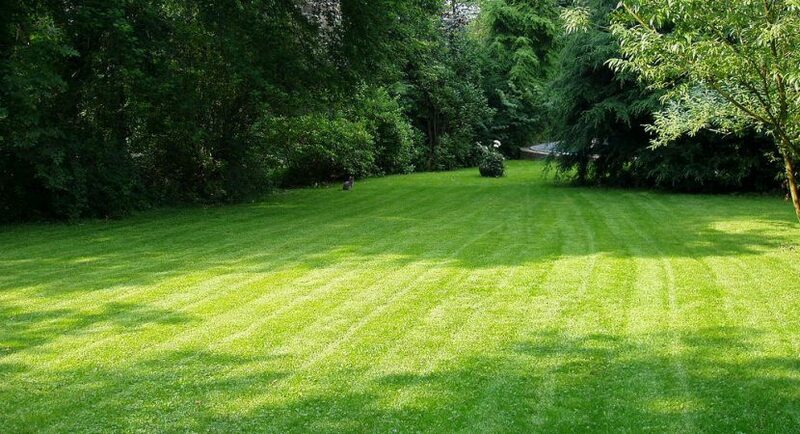 If you want rich, green leaves that are not droopy, you need to fertilize your grass. Sunlight and water are not the only necessities for the growth of your lawn grass. However, don’t over-fertilize your grass either since this kills the roots of the plant. Aerating your lawn can also improve its overall health by supplying more oxygen, fertilizer, and water to its roots. The aeration process involves removing the thatch, along with small plugs of grass and soil, creating the perfect conditions for growth. At the same time, your professional lawn aeration contractor will determine if your lawn could benefit from overseeding. A couple of weeks after the aeration, the plugs that have been removed break down, supplying additional nutrients to the soil. Eventually, grass re-grows in these spots and the rest of the lawn flourishes. The secret behind growing grass in the shade is ensuring that the grass is sufficiently nourished. Therefore, you should pull out any weeds creeping up to steal nutrients and minerals from the grass. Allow your lawn to grow without having to compete for water, nutrients, and minerals with other weeds. No one celebrates an uneven lawn with grass patches in some areas. Therefore, take good care of your grass. Adhering to these tips is a sure way to get your lawn to drool-worthy. If you are looking for commercial building landscaping ideas, be sure to contact the best experts around your locality.